UPDATE: A number of you complained here, on facebook and via email about this app only being available for iOS. 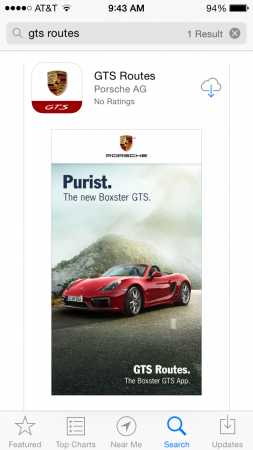 Porsche must have heard you because it's now available for Android devices. The link to download is at the end of the review. What’s your favorite road for a Sunday drive in your Porsche? Is it a special route to work? Back country roads with switchbacks or hairpin turns? The long way home that police don’t patrol quite as often, where the traffic is light, and the corners are just right? Perhaps you have more than one favorite road – which one is better? Who among your friends knows the best place for a weekend drive? The new GTS Routes app from Porsche (iOS version, Android version) may help answer such questions. At a quick glance, the GTS Routes app appears to be a GPS app substitute, but you should know it is anything but! GPS apps help keep people from getting lost on their way to a destination, the GTS Routes app celebrates the journey itself. Instead of declaring when, “You have reached your destination”, the Routes app records thrilling moments during the trip, logging especially exciting corners as “GTS Moments” for you to review when you’re finished. If a road has a sharp bend or sweeping corner, the app records these features. If you meet friends for weekend drives, the GTS routes app can settle disputes about whose favorite back roads are more enjoyable by providing the length of each journey in both minutes and miles, as well as those GTS Moments. The route or "track" with the most Moments per mile (mpm?) is probably more exciting! Currently available for iOS only on the app store, the setup after installation is simple. Instruction screens are easy to navigate, and tying in to your social media account(s) is straightforward. Once installed, the app displays maps of recommended routes that would make great drives. Based on the miles of twists and turns, I have to agree with the Porsche pre-programmed choices. At the time of this writing, these pre-programmed routes closest to my southern Ohio area were somewhere in Ireland and the Smoky Mountains, both of which are a bit far for me to head over and review myself. These routes are published with photographs of the road and you can add pictures to your "tracks" - a feature I admit I won't be playing with because I don’t like to drive with too many distractions. This makes me believe users could get even more from the app with a copilot. For this review, I’ll be testing, by myself, around my hometown of Cincinnati, which won’t be nearly as fun as the Tail of the Dragon or the Smoky Mountains. The GTS Routes app is best used in specialized environments – back roads are where it really shines. The instructions say that GTS moments are captured from twists and turns (it states speed is not a factor in making a GTS moment) so if the app is left on for your entire trip, you can produce some goofy results. I logged GTS moments turning through an intersection and leaving highway onramps – experiences that are pedestrian, at best, but because the GPS indicated a sharp, forty-five-degree turn, it was considered this a GTS Moment. However, when it is used during your favorite back road sprint, you can expect a handy record of the route, by-the-numbers (distance, time, GTS Moments), to review and share. Same Roads, Different Speeds, More GTS Moments! GTS Routes is a wonderful tool to measure your favorite back roads and share locations that bring out the best in your Porsche. Your route is captured and shared with other GTS Routes users, and (if you wish), you may publish completed routes on Facebook or Twitter. The user experience will continue to improve as more users share their favorite routes. In theory, you’ll be able to see more routes nearby to drive and rate yourself. Travelers in a new town looking for fun roads will also benefit greatly from this app’s user-generated content. I think this feature is what makes the app truly special, because its users will have immediate access to a list of terrific roads already vetted by fellow enthusiasts. I personally plan on posting a few enjoyable roads to the app’s public record over the next few weekends via twitter, and I encourage readers to do the same. So, download a copy of Porsche GTS Routes app for iOS or Android and be sure to tag @FLATSIXES when you post your GTS Routes to Twitter. Now, show us your idea of a spirited Sunday drive! *This statement not validated or approved by Law Enforcement Officers, FLATSIXES or the FDA. Use as directed. Never drive above your comfort level or skill. Not responsible for speeding tickets, property damage, or off-road excursions. Is This Die Cast Model Porsche’s 2015 GT3 RS? Why do some companies still make apps just for the iPhone? There are more Android users now and Apple no longer stands alone as the premium smartphone. Our guess, and it’s only a guess, is that Porsche knows their audience. Not to mention that while Android may have a larger total share, the majority of that share comes for “cheap” smart-phones vs. Samsung devices. Those holding the “cheaper” smart phones, for the most part, are probably not Porsche’s audience. Porsche Canada uses BlackBerry’s internally…bwahaha. ^ I agree with Michael. Android version, please. Android Version now available on Play.. just loaded it up! Thanks, Sharker! We’ve updated the post and included a link. Porsche had to have been working on this to have gotten it out so quick. Would have been nice the said it was coming! In that case it is great to know that Porsche listens to the flatsixes & fb communities!! Windows has less than 5% share in U.S. and less than 1% in China (Porsche’s two biggest markets). Probably not worth the cost for them.